The Rhino Coffee Gear Spinjet Pitcher Rinser has been designed to fit in the bench of cafes, restaurants, coffee bars, and juice bars. This vessel rinser features a new honeycomb drain tray and a new Actuator Star design, which both help to prevent liquid build-up. It also includes a Rhino Spinjet Valve which sprays and spins at the same time for an effective clean. Its sitting, at 300mm in length, fits multiple milk pitchers comfortably, making it perfect for all busy hospitality environments. EFFECTIVE MECHANICAL CLEANING- The Spinjet Valve sprays and spins at the same time creating a more robust mechanical cleaning action than regular rinsing valves. It is ideal for plungers using tea leaves, stubborn coffee grounds, and milk and other residues that can often be difficult to clean. 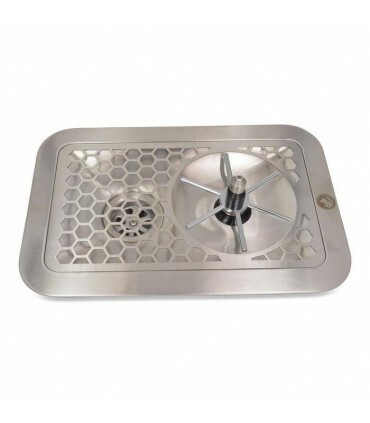 SUPERIOR DRAINAGE - The honeycomb grate design minimises the surface area of the drain tray, reducing static build-up of liquids and making cleaning easy. The low profile body is optimally sloped and angled to ensure effective removal of liquids, reducing common odours caused from static waste. A large drain outlet and wide grate-free opening near the drain creates a convenient location to quickly discard larger volumes of liquid. LARGER VESSEL OPTIONS - The Actuator Star diameter allows both small and larger vessels to be cleaned easily. NSF Certified - All Rhino Milk Pitcher Rinsers are NSF Certified. Do not cut out bench top surfaces prior to receiving your rinser: Due to slight variations in manufacturing design and the varying requirements of bench materials, it is strongly recommended to have the physical vessel rinser on-hand prior to cutting into bench top surfaces.